This Friday we would like to introduce you all to Marshall Burnette. Marshall is a Nashville-based filmmaker you all should keep an eye out for. I'm pretty certain he is going places. As you will find out below Marshall started his journey in the film world with some high adventure sports and cheap equipment. He soon found himself editing for a local production company in East Tennessee and discovered there might be something to his love for video. After completing a degree in Film Production at the Vancouver Film School he had a collection of short films to be quite proud of. 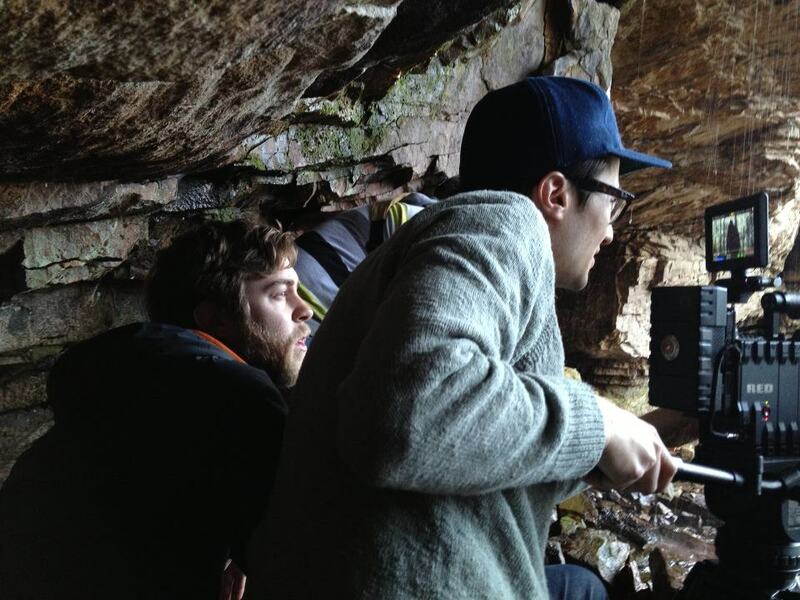 When he returned to Tennessee a number of opportunities came his way in the form of music video production; one of my favorites of his music videos (above) won an award at the 2012 LA Music Video Festival. All of his energy is currently being poured into a new short film called "Devil's Damned To Try," click here to see how you can help him on this project. Without further adieu I share with you a Q & A with Marshall Burnette. Be sure to visit his site as well to see more of his work. Did you start with photography or did you jump in head first with video? Is it common for filmmakers to do one or the other? A lot of people do get into filmmaking through photography first. I use to have a 35mm film SLR camera, and I took a couple of development classes in college, but I never pursued photography. I didn't find myself to be very good at it. I bought a cheap little handicam and started making video of my friends and I riding mountain bikes. That was pretty much the start for me. I worked at an outfitter shop in Johnson City, TN and a customer overheard me talking to a co-worker about editing. Turns out he owned a production company and needed an editor. That is how I got my first job. From then on I've been hooked. What part of the film-making process is your favorite and where do you like to be the most? This is an interesting question because as a Director I am required to work in every aspect of the process. Pre-Production, Production, and Post all have their highs and lows... but I guess I'd say I like the actual production the most. It's a thrill to be on set making things happen that have only existed in your head before. I really enjoy the writing process also. It's still the hardest part to me. I admire good writers so much. It's something I still need a lot of practice at. Do you have any influences in the industry? Sure. As with any art form, it's important to study the greats. Just as a painter would study Picasso or Van Gogh, it's important for filmmakers to study Coppola, Loene, and Godard. I watch movies everyday, pretty much. I try to see everything I can get my hands on. Some of them stick with me, some don't. But I think when a filmmaker says this is too violent for me, or I don't like this because it goes against my morals, or I don't like this because there's not enough action, that is when we put ourselves in a box and miss out on some great learning opportunities. Not every film is going to reinforce what we believe as individuals, but that is the point of the medium right? To show us a world we have never experienced? Do you think your southern roots play into certain themes you find in your work or in ideas you would like to create? Absolutely. I am a strong component of "write what you know." I feel like I can actually contribute to the world by telling stories of places and people I know, instead of making stuff up that I have no clue what it means. I grew up in the south and feel like it's my responsibility to represent where I'm from. I also find the people and places of the south to be very interesting. I'm not hating on New York or LA stories, but I think we've seen a lot of it and it's time to see something new. I know you have done a number of music videos lately...would you like to stick with that or would you rather be doing something else? Well, I love making music videos. It's just very rare that I get complete creative control on those projects. I am usually satisfying a production company as well as the musical artists... and they have their own ideas of what the video should be. I hope to one day be trusted with complete control on these projects. I would enjoy that a lot more. I think music videos are a great testing ground for narrative filmmaking. Through making music videos, I've been able to make a lot of mistakes and also discover a lot of cool techniques. I have noticed that your most recent work centers very much around telling a story about the characters involved--how does telling a story play into your love for film? That is what film is to me. I've never been good with making flashy visual videos. I love the puzzle of telling a story on film. That is what it is to me, a puzzle. And the quality of the film depends on how you go about putting those pieces together. I noticed when I was in film school that a lot of people were trying to make short films with action scenes, explosions, effects, etc... and they didn't work. I figured it's best to learn how to convey an emotion before you start blowing things up. Who cares about a character blowing up if we have no emotional connection to that character. Do you have any dreams about the work you will one day create? All the time. i have no idea where this filmmaking thing is going to lead me. I'd love for people to enjoy the films I make so I can keep making more. I guess that's about it. I have a couple films floating around in my head at the moment. Weather or not those will ever get made is unknown, but I finish what I start and I'm never happy with what I finish... so I'll keep doing that until I'm satisfied. Do you have any current projects you are working on? Tell us about them. Yes, I do. I am currently in post-production on a short film called "Devil's Damned To Try." I wrote the film last year. After 7 drafts of the script we were ready for production... but had no financial supporters... so I self-financed it with some help from my Producer Henry Reed and Cinematographer Dustin Lane. It's a 20-30 minute film about an Appalachian man's descent to madness in the aftermath of a traumatic hunting trip. We actually are running a Kickstarter.com campaign right now to help raise finishing costs. If we can reach our goal we'll be able to get a pro-coloring and a great sound design. You can visit the Kickstarter page to view the first teaser for the film. Belated virtual love to our moms! Big News for You! And Alison!